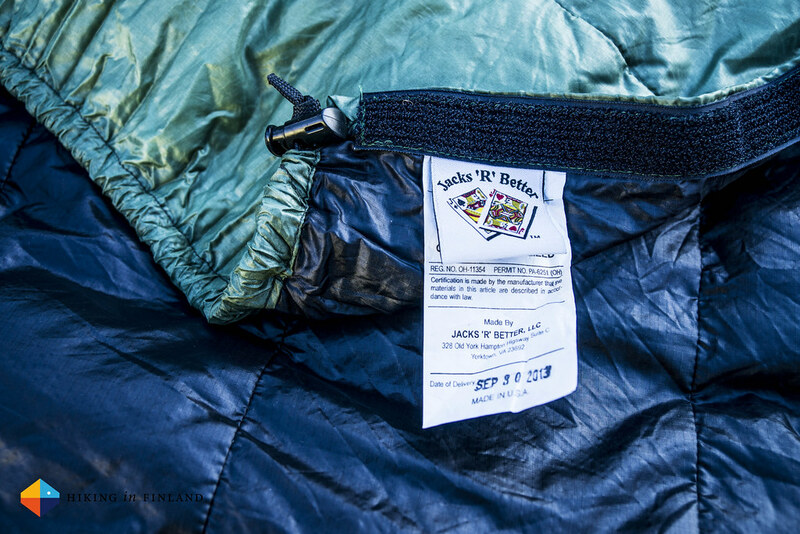 The Jacks ‘R’ Better High Sierra Sniveller is the Multi-Tool amongst the winter quilts, as it not just is a toasty quilt for your autumn to spring backpacking trips but also works as a Poncho/ Serape and can be used with your hammock. Toasty times! The Jacks ‘R’ Better High Sierra Sniveller arrived in December 2013 at HiF HQ and has seen several outings since, amongst others to the Lake District in England. 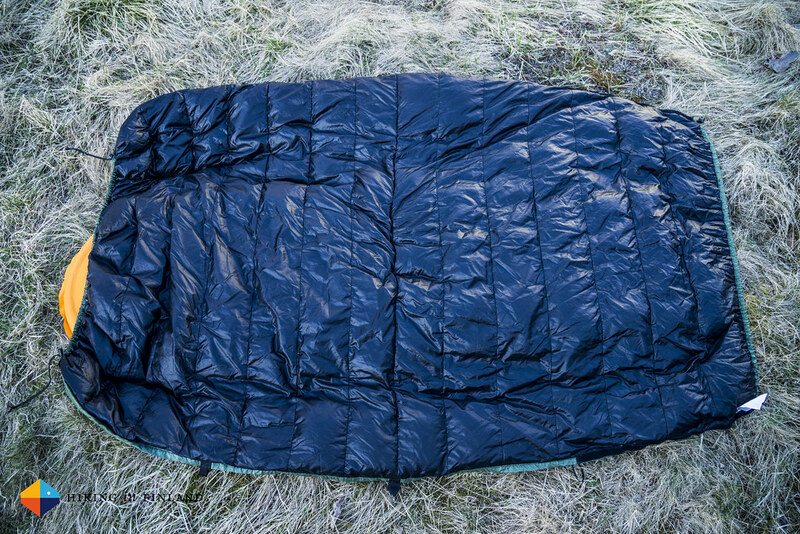 Made for cold temperatures the High Sierra Sniveller is a winter quilt which should keep you toasty to around -5°C to -10°C, maybe even colder temperatures if you’re a warm sleeper. 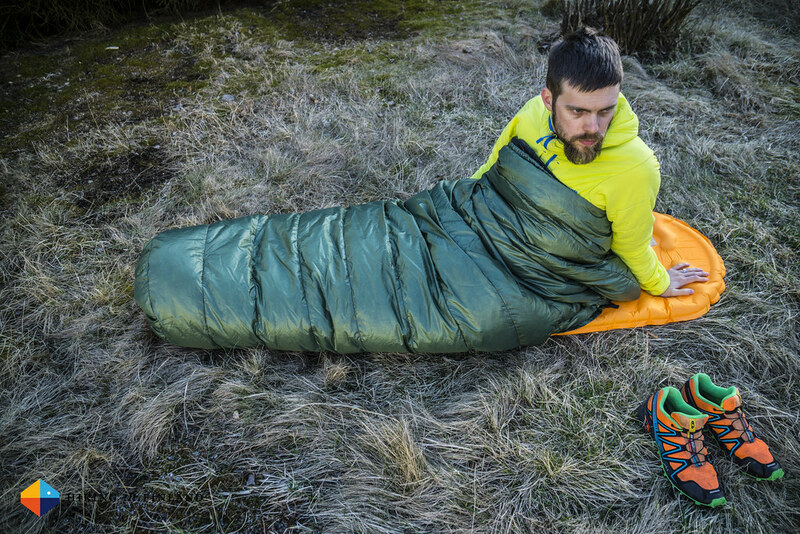 The High Sierra Sniveller can be used as a flat blanket, a sleeping bag/ quilt and a serape. A serape is like a poncho, and for that it has a Velcro head hole in the middle which you can open and put your head through. You then can tie it closed around your waist to minimize drafts. The JRB Sierra Sniveller Quilt is very well constructed, with clean seams, durable and high-quality materials. 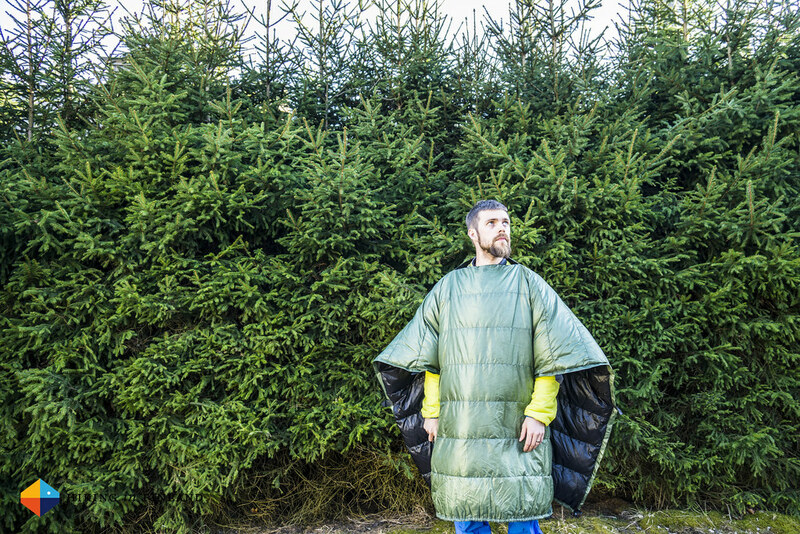 It uses a 1.1 oz., 30 denier ripstop nylon and 800 cuin fill power goose down. The shell & lining material is soft and comfortable on the skin and the high-quality down keeps you toasty warm. That’s a very good weight for a winter quilt, especially when set in relation to the price. The Quilt Comparison Chart is ideal in my opinion for anyone considering a JRB quilt. These kind of tables should be standard for any company offering many similar products within the same category, as it makes choosing the right product for a customer much easier. The High Sierra Sniveller is unassuming. 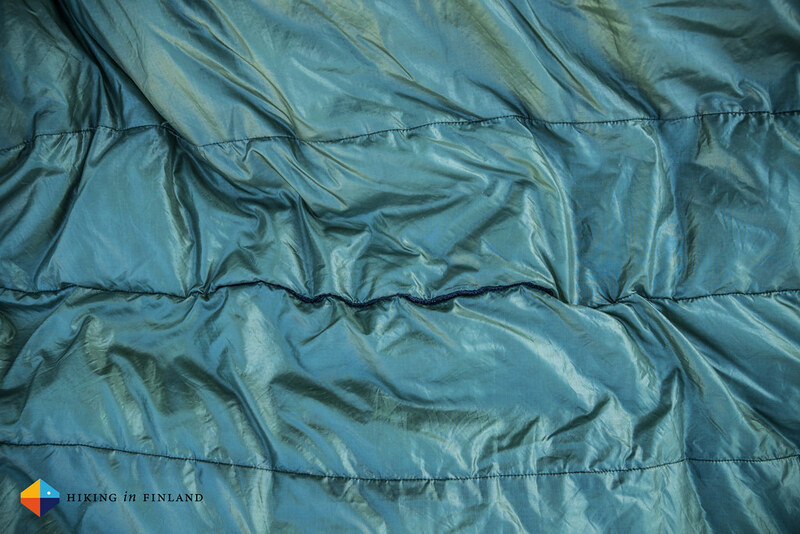 A green, stealthy shell blends in in forest environments, and the black inside helps with drying the quilt in the sun in the morning. The construction is clean and sturdy, and while being lightweight I didn’t have the feeling that I need to treat it with silk gloves. The cord locks and cords as well as the Velcro closures radiate sturdiness, too. 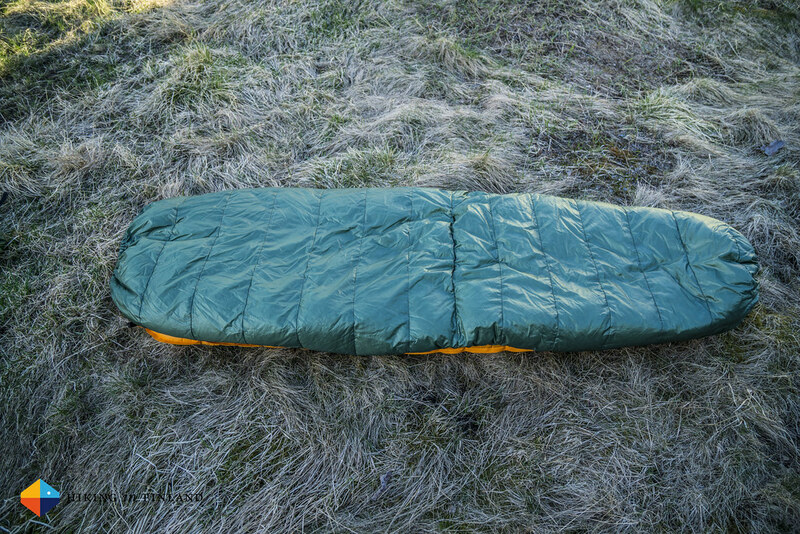 I have used the High Sierra Sniveller mostly as a quilt/ sleeping bag and a flat blanket, in both configurations I was very happy with it. The footbox is long enough for me and it is easy to take one leg out of it to “cool down”. The Regular length has a small taper, it’s 132 cm wide at the top and goes down to 96 cm at the foot end. It was a good size for my thin self and drafts where no problem, also when sleeping on my side. I have used the JRB High Sierra Sniveller on autumn and spring trips where temperatures went down to around -2°C and it was too warm for me in those conditions, so I think it’s easily good to -5°C to -10°C as claimed by JRB. If you like to strap the quilt to your mat then there’s three pairs of webbing loops to allow you to do that. Using it as a serape is only something for morning and evening use in Camp, I wouldn’t want to wear it while moving throughout the day - it’s not very ergonomic. 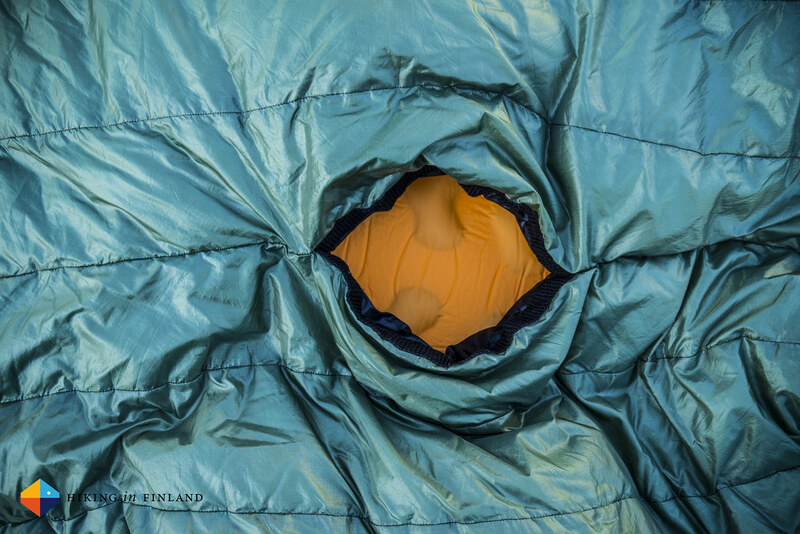 If you’re out on a winter trip and want to minimize the puffy, space-consuming down jacket for camp and breaks, the High Sierra Sniveller will be a good solution for you. The draw-back is that you need to be more careful around campfires when wearing your High Sierra Sniveller, as you don’t want any holes from sparks or such in it. If saving weight & space is a high importance, then the multiple use aspect of this quilt will be high. If not needed the head hole closes tightly and almost can’t be seen, and also has not been a source of drafts or similar. This is a good feature for people who want it, and if you don’t need it it’s easy enough to ignore that it’s there. I didn’t like the compression bag a lot - it does tend to get into a strange shape, and the biggest problem I have with that is that packing it in a backpack creates some unusable, empty space. Also the pull strap you can hold on to feels, while being sturdily sewn, that it could break. I much prefer super basic roll-top closure stuff sacks that are light. The storage “sack” is a plastic square bag with a zipper, which I also felt isn’t the best place to store a down bag. Here I prefer large (organic) cotton bags or at least a fabric that’s breathable. Organic cotton bags also would be more environmentally friendly, and look nicer if stored in plain sight. With the sleeping bag I have no serious complaints. 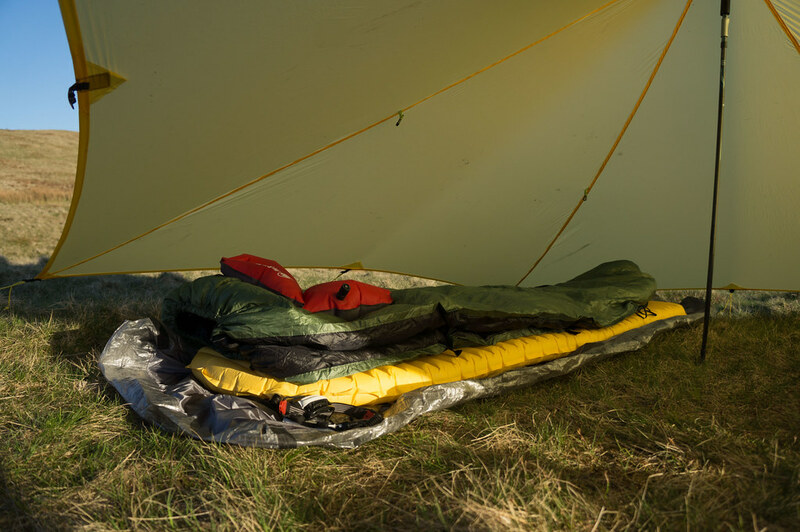 I saw that the head end got a push button in 2014 which allows you to close the quilt around your neck so it stays in place, this is a nice feature especially on more breezy, cold nights as it keeps drafts out and the warm air in. JRB also is now using a hydrophobic down, which is good for a quilt which is likely used in wet & cold environments. The cord locks and cords are very durable and big, I imagine JRB could easily use smaller & lighter versions of these without making them more difficult to use but saving a bit of weight. I also would put the top loops for attaching the quilt to a mat further down, though in use the two pairs in the middle should be enough if you use that feature. The quilt maker market has seen some influx in the last years, and also some big brands have started to make quilts. 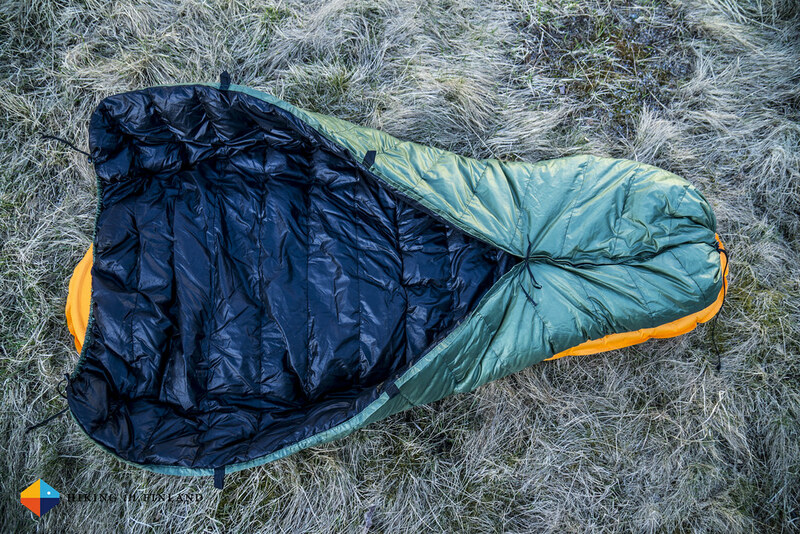 Directly competing with the JRB High Sierra Sniveller are for me, given it’s unique feature set, only the As Tucas Sestrals Poncho and the MLD Spirit Quilt, though both are synthetic insulation quilts. These have the option to wear it as a poncho. 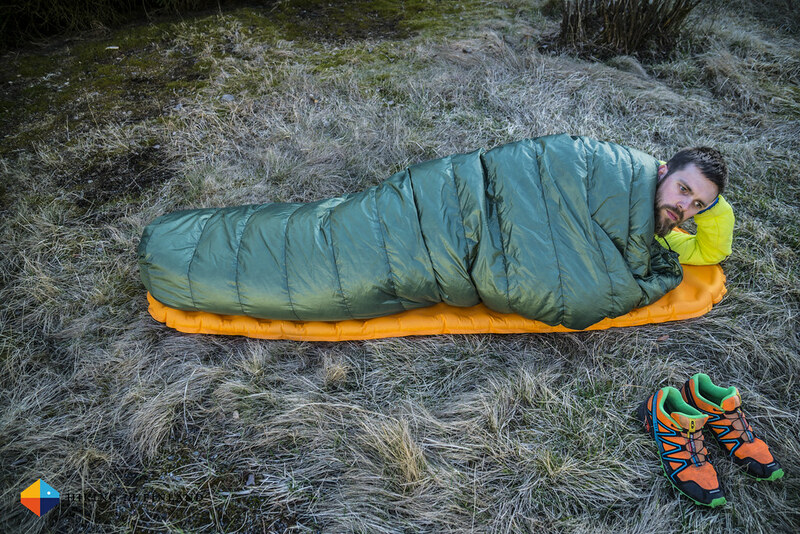 A warm winter quilt is also the Katabatic Gear Sawatch Quilt, and then there’s several other quilts & sleeping bags which are fit for winter use. 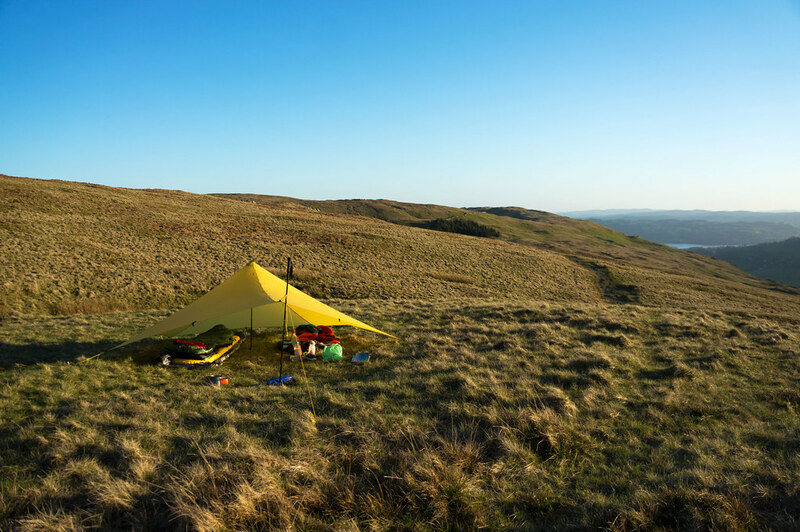 The Outdoor Gear Lab gave it 4 Stars and T.R.E.A.D. Outdoors rates it high, too. I like the Jacks ‘R’ Better High Sierra Sniveller. 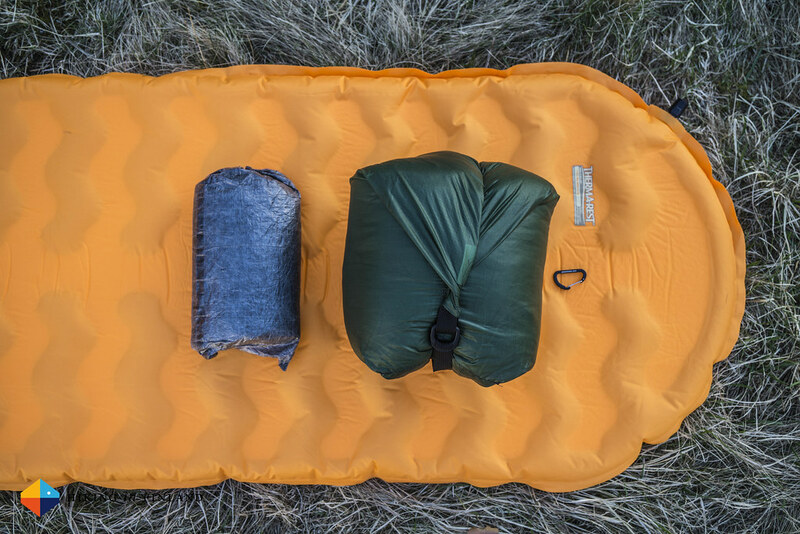 The Multiple-use aspect of it is great: You can use it as an open blanket, a quilt, a poncho and also as a top quilt in your hammock, which is superb value for your money - if you need these options. 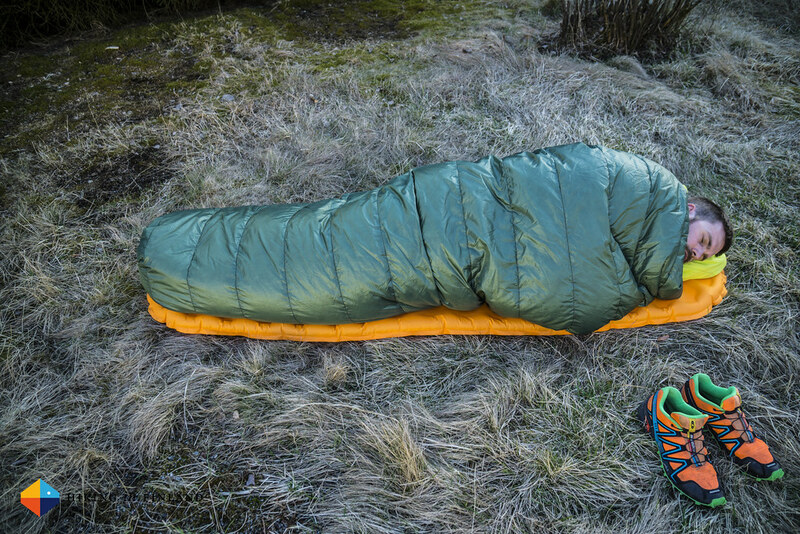 If you don’t plan to use the High Sierra Sniveller as a serape you might be able to save some weight by getting a quilt without the head hole, though it probably is useful to have in an emergency - and does not add a substantial amount of weight. As a quilt it performs just as it should: Unpack, let it loft and then have a comfortable, un-restricted night’s sleep underneath it. It’s easy to vent when you run warm, and if you plan to use it as a serape it will save you money that you’d spent on a dedicated down jacket. 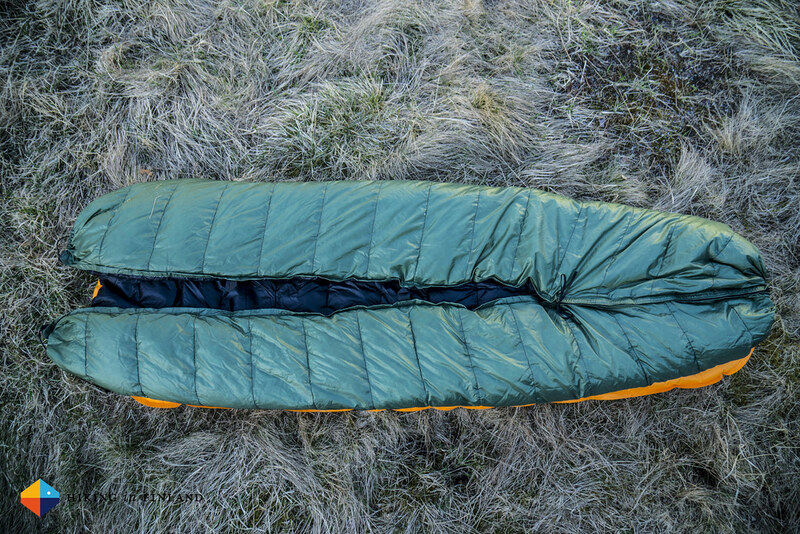 If you’re looking for a multiple-use, lightweight, warm and affordable autumn to spring quilt, take a good look at the High Sierra Sniveller from Jacks ‘R’ Better - you won’t be disappointed. You can buy the High Sierra Sniveller at Jacks ‘R’ Better. Right now it is on Sale and starts at $310 (regular price starts at $410).